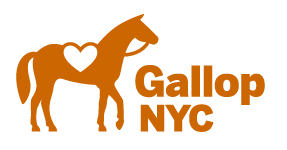 GallopNYC is a non-profit organization based in New York City that offers therapeutic horsemanship programs to children and adults with disabilities. We serve 500 riders a week and operate our riding program at four locations. Two of the locations are operated by GallopNYC primarily for therapeutic programs. Schedules at each location vary seasonally. GallopNYC uses therapeutic horse back riding to help riders In NYC with disabilities walk, talk and learn, inspiring them to live their lives as fully, independently and productively as possible. That every child with a disability in New York City has access to therapeutic horseback riding.